This article explains the difference between using the object cache in SharePoint Server 2013 on-premises and SharePoint Online. There is significant negative impact of relying on the object cache in SharePoint Online deployment. Any dependency on object cache in SharePoint Online will reduce the reliability of your page. When SharePoint Server 2013 is hosted on-premises, the customer has private front-end web servers that host the object cache. This means the cache is dedicated to one customer and is only limited by how much memory is available and allocated to the object cache. Because only one customer is served in the on-premises scenario the front-end web servers typically have users making requests to the same sites over and over. This means that the cache gets full quickly and remains full of the list query results and SharePoint objects that your users are requesting on a regular basis. As a result, the second time a user visits a page, the page load time improves. After a minimum of four loads of the same page, the page is cached on all of the front-end web servers. 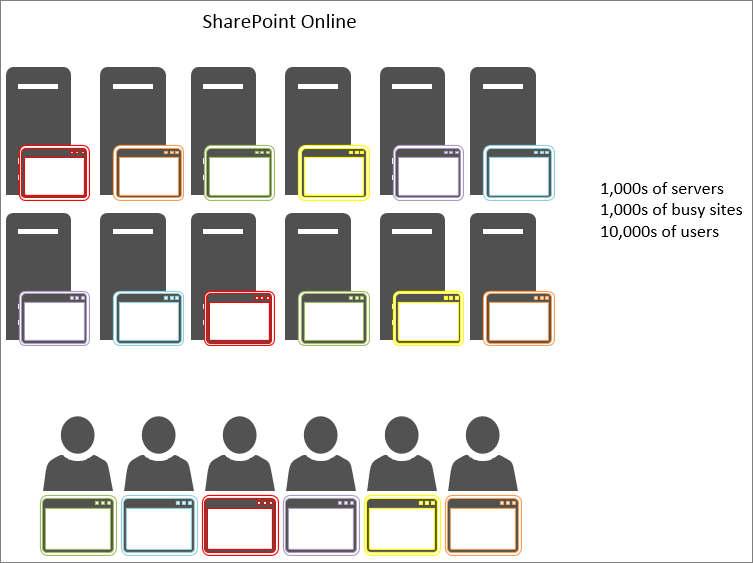 In contrast, in SharePoint Online there are many more servers but also many more sites. Each user may connect to a different front-end web server that doesn't have the cache populated. Or, perhaps the cache does get populated for a server, but the next user to that front-end web server requests a page from a different site. Or, even if the next user requests the same page as on their previous visit, they are load-balanced to a different front-end web server that doesn't have that page in its cache. In this last case, caching doesn't help the users at all. In the following figure, each dot represents a page that a user is requesting and where it cached. Different colors represent different customers making shared use of the SaaS infrastructure. As you can see from the diagram, the chances of any given user hitting a server with the cached version of their page are slim. Also, due to the large throughput and fact that the servers are shared between many sites, the cache doesn't last long since there is only so much space for caching available. For all of these reasons, relying on users getting cached objects is not an effective way to ensure a quality user experience and page load times in SharePoint Online. If we can't rely on the object cache to improve performance in SharePoint Online, what do we use instead?